Google recently sent out promotional coupon codes to all of its Google Analytics users for use in AdWords, as a way to encourage website owners to try out AdWords. Often third parties such as web hosting companies or other online businesses will offer similar coupon codes (often these will come with their own set of terms of conditions, so please read the small print). For example Blacknight currently offers a variety of different AdWords vouchers when you sign up for hosting services with them. The primary purpose of these types of coupons is to introduce AdWords to new users, to allow you to try out the advertising system and spend very little of your own money in doing so. You can safely experiment with AdWords, investigate its features and then decide if it would benefit your business. These coupons are great for anyone that has never tried AdWords before, but these coupons are not intended for use with existing AdWords accounts. This is one of the major support issues that has cropped up with existing advertisers, as well as the numerous other questions that have been posted in the support forums by new AdWords users. 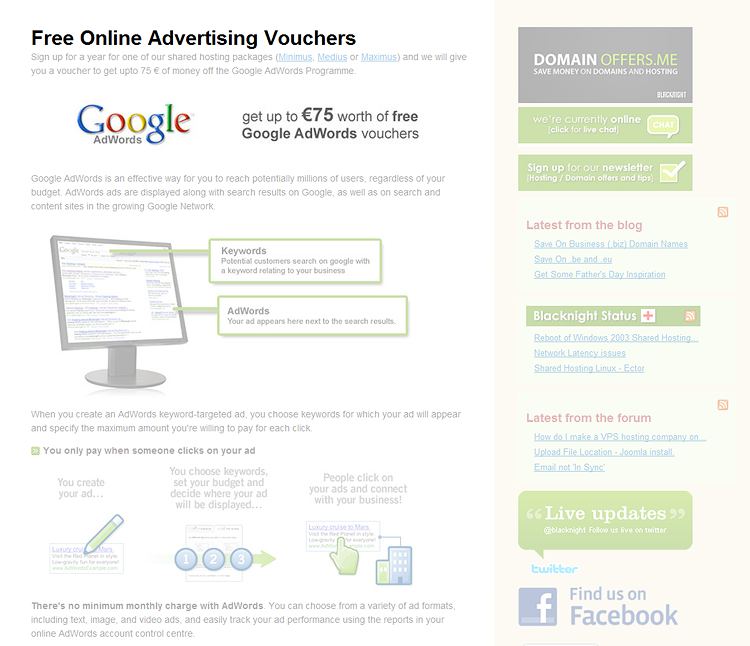 This blog post aims to cover the most common issues with regards to these Adwords vouchers. We are also giving away free AdWords Promo Codes. 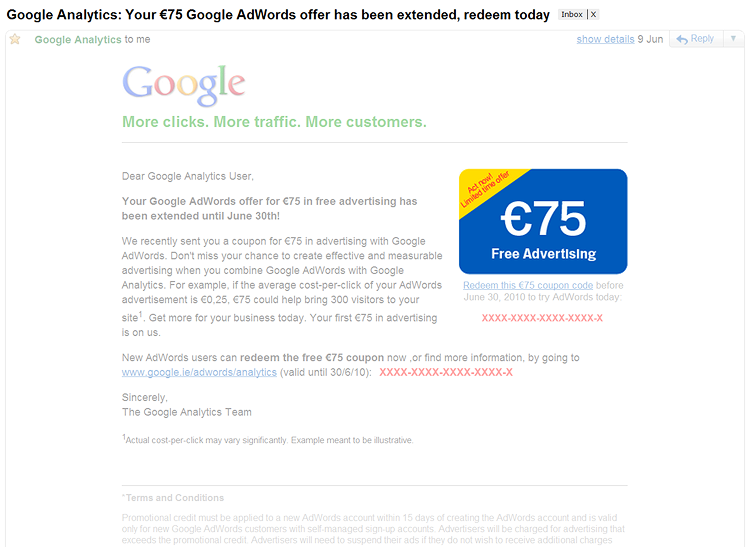 If you already have an existing AdWords account you cannot apply this coupon code. This also applies to AdWords accounts that were opened in the past but were never used or activated i.e. you set up your AdWords account but never ran an advertising campaign, or failed to fully activate your account by entering your billing information. As long as your account is under 14 days old you can use the coupon. If you already have an AdWords account you cannot open a new account in order to use this coupon. Having more than one AdWords account is against the terms of service (unless you are a third party or search engine marketer). If you attempt to add a promotion code to an account that is over 14 days old you will see a “Promotional Code Invalid” error message, even if the promotion code has not passed its expiration date. You may also receive this error message if your promotional code is invalid, or if you have failed to enter it correctly (the code is case sensitive). The expiry date is the deadline by which you need to create and redeem the coupon code in your account. As long as you apply the coupon code to your account before the expiration date you can spend the amount credited to your AdWords account whenever you want. So if you applied the coupon in May, and the expiration date is in June, you can continue to spend this amount after June. There is no rush on when you should spend this credit. However, in some instances Google has been known to extend the expiration date of their promotional offers, which you would be notified of via email. If you received more than one coupon code you can only apply one of these to your new AdWords account. If you have two coupon codes, make sure to redeem the one that has a greater value, and if you’ve already applied a promotional code to your account, you cannot use another one. When you open a new AdWords account you are charged a one-time activation fee. This applies even if you sign up with a promotional code. The fee is nonrefundable, even if an account is open for just a short time and is not used for advertising. Google charges this activation fee to help cover the costs associated with creating, maintaining, and, if applicable, cancelling an account. It is also a way for Google to verify your method of payment. This is important because it is possible to build up advertising costs that exceed the coupon code credit amount. How you are charged for this fee depends on which mode of payment you choose for your account. There are two methods of payment in AdWords, postpay and prepay. You must enter valid billing information before your ads can run. This is true even if you enter a promotional code. If you choose postpay by credit card or debit card, the activation fee is deducted from the coupon code credit amount. If you choose postpay by direct debit, the activation fee is taken from your bank account when your payment details are verified. You will then have the full amount of your promotion credit to advertise with. If you choose prepay you must make a prepayment before your ads can run. This is true even if you enter a promotional code. Once you’ve made this prepayment, the activation fee will be deducted. The amount that is left over after the activation fee has been deducted from your prepayment will be added to your overall account credit. The actual fees charged will depend upon the currency of your own billing country. Where Do You Apply the Promotion Code? There are two methods for redeeming your promotion code – entering the code manually, or if you received your code via email clicking on the URL given to you. You must go through the entire AdWords account setup process before entering your coupon code – this includes choosing your method of payment and billing details. 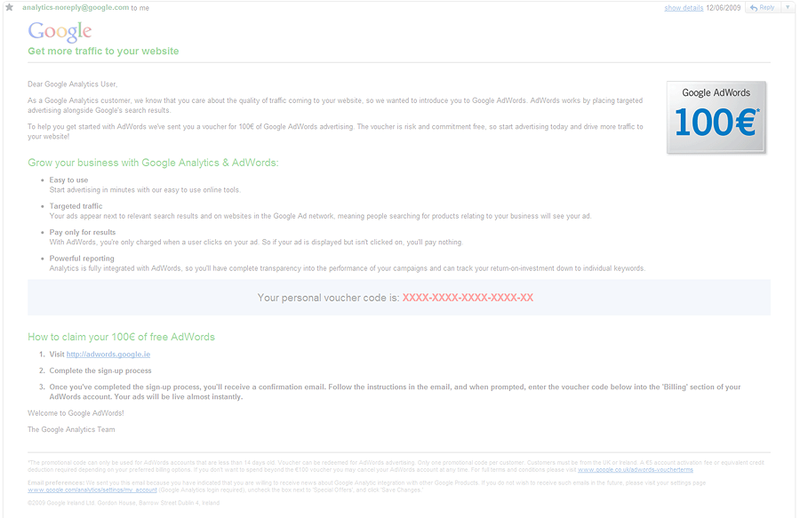 You must enter valid payment information in order to activate an AdWords account. These details are essential for Google to ensure users do not abuse the AdWords system by having multiple accounts. Once your account has been fully activated you can go to the “Billing” tab, click on “Billing Preferences” and if you scroll to the very bottom there is a box to put your promotional code into. The mailer or email you received may have given you a URL to use when setting up your AdWords account and indicated that the credit would apply automatically to your account. If this is the case, you can leave the promotional code field blank, and the credit will be applied automatically to your account. If it hasn’t automatically updated after a few days, contact the Google AdWords support team or the support team of the third party whom you received the email from. Once the initial promotional credit added to your account is depleted you will begin running up real costs. So if your costs exceed the promotional credit you will be billed for this amount. This is why you must complete your billing information when you are setting up your AdWords account. Prepay accounts must have credit added to them in order for your campaigns to run, but postpay allows you to build up costs and pay them later. So if you have chosen to pay by postpay your ads will continue to run after your promotional credit has run out, and you are responsible for any charges that occur after that. However, you do have the option of pausing all of your campaigns to stop this from occurring, but you will need to do this before the entire credit runs out. Also, if you want to reduce the likelihood of this occurring then setup a prepay account, instead of a postpay one. If you are prepaid, Google will not automatically charge you, you have to enter payments manually to “top up” your account. The only downside to choosing prepay is that you cannot change this to postpay at a later date. If you do want to choose postpay, in order to manage your spending make sure to login to your AdWords account on a regular basis to check the account statistics and balance. If you find you are starting to reach the end of the promotional credit and do not wish to incur additional charges, gradually pause some of your campaigns, until the full amount is depleted and all your campaigns are paused. Before setting up your new AdWords account make sure that the product you wish to advertise complies with Google’s advertising policies. This promotional activity from Google is great way for website owners to finally try out AdWords, without having to worry too much about making trial and error mistakes with their own money. The best advice that we can be give is to always carefully read the terms of the offer you have received – there is always a fine print attached to these coupon codes that outline their exact terms and conditions, making sure to read these before trying to use them can save you a lot of stress in the long run. In some instances Google might send an offer that’s different from the one outlined above. So reading the terms and conditions is essential to see if you’re eligible to use the promotional code. If you think we have missed anything from the list of common problems outlined above, please leave us a comment below. *Terms and Conditions of the €75 coupon code distributed to Google Analytics users in May/June 2010. My time with adwords has been hit or miss. I made some money, but for some reason could not optimize some campaigns to convert despite great ad performance. such an interesting and informative post. thank you for sharing this one. No problem Louise, glad you found it helpful. Having never used google adwords before I found my coupon most useful. In fact at first I though it was some kind of magic advertising as I got two orders within the first week – but alas then nothing again until the voucher ran out! Sorry to hear that Tom, good luck with your AdWords account in the future. I’m a bit ashamed to say this, but I’ve never understood how to use coupons in adwords! 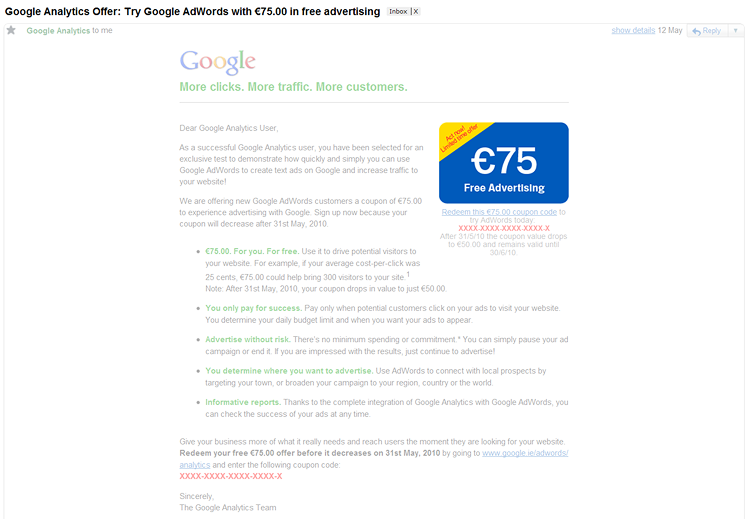 Thank you for the advise, I’ve not used Adwords yet but I’m sure this will come in handy. Hi Liam, this is sure to come in handy. I am running ad-words campaign for my business and when i sign up i got 75$ as free ad-words and 3 months after i received a Google ad-words free coupon through post to my office and i entered the voucher code in my Redeem code and it had been accepted and amount had been added to my ad-words account and recently 1 week back i got another one. Will i face any problem if i use this free ad-words vouchers multiple times? Because i am getting these posts directly from Google postal address ( These vouchers are not provided by any third party Google partners). Please reply me. Thanks for the insight Sinead. Google Adwords coupons are such a hot commodity. It’s so nice to find such a clear explanation of where / when / and how to use them. Have you guys ever run a charity’s 10K a month voucher? The charity voucher has a big problem, you can only bid a keyword up to 1 dollar per click.